THE AUTHOR: Most of the books below were written by A.C.Bhaktivedanta Swami Prabhupada. Srila Prabhupada, a fully self-realized spiritual master, founded the International Society for Krishna Consciousness (ISKCON) and The Bhaktivedanta Book Trust (BBT). He wrote more than 60 volumes of authoritative translations and commentaries on the philosophical and spiritual classics of India, and they have been translated into many languages. Highly respected by the academic community for their depth and clarity, they are used as text books in numerous college courses throughout the world. 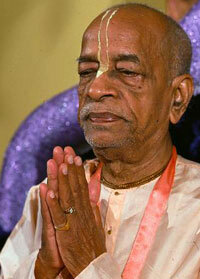 For more information about Srila Prabhupada, click here. THE NARRATOR: Amala-bhakta Swami is a direct disciple of Srila Prabhupada and an ordained minister of ISKCON. He has been teaching yoga in general since 1958 and Bhakti Yoga in particular since 1976 and has recorded many of Srila Prabhupada's books. Inspirational and uplifting, these recordings are sold in stores and broadcast on radio stations around the world. SPECIAL OFFER: This complete set is now available on a small USB stick (a flash drive) or through a download into your computer from amalbhakta@hotmail.com for only $150.00 (discounted almost $150.00). You may pay by credit card (phone 310 838 4474) or by PayPal. Non-US orders please add any PayPal foreign exchange fees. With this set comes a valuable bonus of Dravida Dasa's narration of Srila Prabhupada's Complete Bhagavad-gita, which includes all the Sanskrit verses, translations, and purports (a $ 20.00 value). It also contains a long-playing MP3 of Srila Prabhupada's chanting japa and accompanied by beautiful musical and nature sounds (a $5.00 value). You may also order one or more particular audio book titles for download only, but they are sold at our regular catalogue prices, as listed below just under the album picture. Listen to a fascinating story now from the Spiritual Stories album entitled Dhruva--The Child Saint by just clicking the PLAY button below. Click on the websites prabhupadaradio.com or mayapur.tv. Then click on the Amala-bhakta Swami stations, which continuously stream some of the below audio books, such as the Srimad-bhagavatam and the Sri Caitanya-caritamrta.